New video shows wedding band customization. Novell Design Studio, an American wedding band and bridal jewelry manufacturer with over 22 years in the jewelry industry, is proud to announce the launch of its latest online video brochure. This brand new video illustrates Novell’s unique customization capabilities with several wedding band morphing segments which are set to original music. Any average consumer looking to purchase a wedding band can learn about what makes Novell different from nearly all other manufacturers; the ability to make almost all of their wedding band designs wider, narrower, in different metals (platinum, palladium or gold), with different finishes, and much more. Why settle for ordinary, when only the best American-made wedding bands and bridal jewelry should do? Video brochure for Max Squared wedding bands. 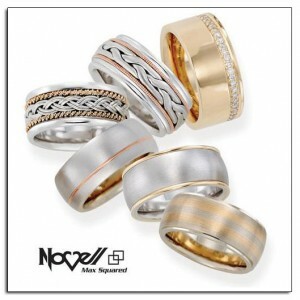 View the latest video brochure for Novell’s Max Squared wedding bands. The BOLD wedding band for the BOLD new man! Available in platinum, palladium or gold, Max Squared wedding bands are wider and thicker than the average wedding band style. Novell superior manufacturing insures that the new man can get his new ring almost any way that he wants it, and by nearly any deadline. After all, the new man never settles. He is in command of his expressions, and of his destiny, in life, love and happiness. Visit http://www.novelldesignstudio.com/max/ to download the latest brochure. Max Squared wedding bands - the BIG and BOLD wedding band.